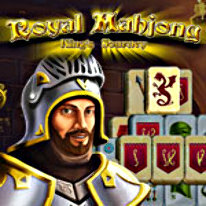 Travel across your realm, collect gold and silver tiles, grow your riches and fill your treasury! Your Highness, you have a very intense day ahead of you! First, the royal hunt awaits you in the Forbidden Forest. After the hunt, you'll visit the armory, where our best armorsmiths will present their wares to you. But the highlight of the day is a knight's tournament in your honor. You didn't forget that the winner of the tournament will receive a gift from you personally in a ceremony in the throne room, did you? Throughout your journey, you will play a wonderful game in which you make chains of tiles and grow your riches in the process. Onward, Your Highness, to play and win!